We look forward to seeing everyone's submissions! The shield resembles the Philippine flag,for the reason that we, In this team are all filipinos from all around the globe. United to conquer the ultimate kings pvp. The damaged shield and sword symbolizes how we struggled our way through the challenge of kings pvp. But we know no hindrance.there are even more stronger enemies out there,but our dreams will not be disrupted by anything or anybody. And this is why we have wings, we have the courage to fly and strive for our dream to reach the top and earn the greatest reward, the crown. Meaning: The idea is mostly self-explanatory. 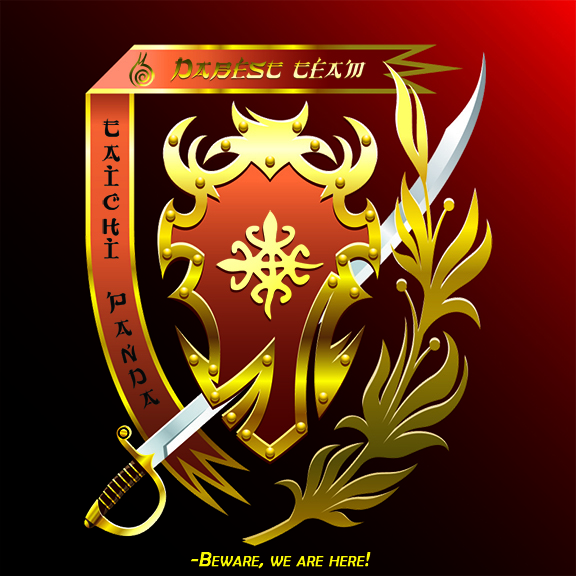 The shield is to represent the leader of the team, and of the guild; your highness. With the crown on top, 5 gems and crown arrows representing each one of us. " G,R" is significant to our guild name meaning history, "Thelema". Motto: "Love is the law, love under will". Slogan: TAKE IT TO THE TOP! Explanation: We are always ready for a fight , like the legendary Taichi Panda! Slogan: Only VIP´s will Survive! Last edited by Dynamo on Wed Nov 25, 2015 10:09 am, edited 1 time in total. The wings stand for the very well known ingame vip-wings, part of our winning combination. Our tactics lead us to be number 1 in our server and silver III all around the roster. Not much being said, wearing military grade equipment, we are summoned from the Avzarian sky, we fight intense, we win or die trying. Last edited by uzunfatihresmi on Wed Nov 25, 2015 3:26 pm, edited 1 time in total. The background is a mixed of a Philippine and USA flag because some of our members came from both countries. The background symbolizes unity of all the members.The skull with a SNAIL logo in his cap represents that we are all global players and the gun symbolizes power and death to those who come before us. The wreath beside symbolizes that we are wise and tactical in every decision we make in the KING'S PVP BATTLEFIELD. PHOENIX symbols represent our team freedom, power, strength and renewal that have the ability to soar the sky-soar the highest possibilities to reach our goal as a team in the battlefield. YIN-YANG symbols represent our team perfect balance-harmonic balance in battlefield. DRAGON symbols represent as a protector-that's our team. *MOTTO: ONE for all, ALL for one. Theme color "Maroon" represents victorious in battle. The "Banner" represents devotion to the team. The "Sword" in coat of arms represents justice and honor. The "Great Shield" defending our honor and make us invulnerable. The "Wreath of Laurel" to emphasize strategy and intelligence in battle. The symbol in the Center "UNITY IN DIVERSITY" means we are united even though we live in different places and timezone, we are still able to set time to stand in KING PVP to defend and to win. Slogan: Beware, We are Here!